Is Lotto1010 a Scam or Legit? Read Reviews! Lotto1010 Exposed — Make Sure You Read the Small Print! 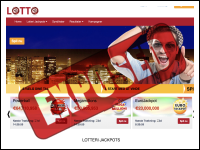 Looking at Lotto1010.com was a bit of a struggle as it’s all in Danish. This online lottery provider offers the four largest lotteries plus three syndicate options. With a motto of “selection as well as quality” they claim to offer the most popular lotteries and other smaller ones. I don’t see it, but maybe it’s a language thing. Let’s take a look. Please note that currently players cannot play actually play individual lotteries at this time. Not sure what the story is. Lotto1010 definitely has the four largest lotteries US Powerball & Mega Millions, EuroMillions and EuroJackpot. But, now I’m scratching my head. Click on any of the games and four different days of the week comes up. Digging into the terms and conditions (they are in English), they say “US Powerball usually played Thursday and Sunday”. Hang on, it’s actually played Wednesday and Saturday. Okay – if you are targeting players in the European Market, the draw does actually take place those days, but why list all the days! Funny, in their T&C, lotto1010.com describes the rules and regulations for a bunch of other European lottery games. I guess they are planning to expand their stable of lotteries. There are currently three syndicates available. The US Combi (US Powerball & Mega Millions) 82 has 41 ticket lines for 82 shares. The VIP 500 syndicate has 80 ticket lines with 500 shares. The VIP 90 has 120 ticket lines with 90 shares. But – yes the big but, the actual ticket lines are split between the different lotteries. Take the VIP 500 syndicate for all four lotteries offered. That means there are only 20 ticket lines for 500 shares per draw. That’s definitely not a ratio I’m looking for! Players can either deposit money to play into their account or can pay as you go. Lotto1010.com says that if you deposit less than €10, there can be additional fees. Reading in the FAQ, players cannot withdraw a sum less than €50. But jumping into the terms and conditions, Lotto1010.com says that players can only withdraw “higher amounts than 100 units of the relevant reference”. What gives? There is also no information on whether they take commission, though they do mention that fees and other costs will be deducted prior to you receiving your winnings. Who Can Play at Lotto1010.com? Besides the usual, you have to use your own name to register, players have to be either older than 18 or old enough to play legally in the country they reside. People cannot play from Afghanistan, China, Cuba, Hong Kong, Iran, Israel, Myanmar, North Korea, Singapore, Turkey and the United States. Oh, and there is the weird blurb about people who are prohibited by the “Office for Foreign Assets Control of the US Department for the Treasury”. Lotto1010.com is operated by FUPMB LTD based in Cyprus and licensed by Curaçao. It has a snail mail address, email address, phone number that has an off service recording and online chat that seems to be active outside of business hours (whenever that might be). Chatting with their online service did get me wondering. The person kept pushing VIP 500 and subscriptions, plus wouldn’t discuss their straight ticket purchase versus syndicates. Would you mind rating Lotto1010.com? The different conflicting information on this site really started to make me wonder what the story is. Talking to their online chat person pushing subscriptions and their VIP 500 syndicate didn’t build my confidence. And given the ratio of ticket lines to shares for their VIP 500 syndicate, I wouldn’t touch it. Even weirder is the fact their site is all in Danish except their Terms and Conditions and there they say they will have the T&C in multiple languages but the English version rules. Lotto1010.com gets a thumb’s down. The fact that they have an online chat is cool, but it would be great if the person knew what they were talking about.